How Does Enzyme Biotechnology Impact My Everyday Life? Here are some examples of enzyme biotechnology you might use every day in your own home. In many cases, the commercial processes first exploited naturally occurring enzymes. However, this does not mean the enzyme(s) being used were as efficient as they could be. With time, research, and improved protein engineering methods, many enzymes have been genetically modified to be more effective at the desired temperatures, pH, or under other manufacturing conditions typically inhibitory to enzyme activity (e.g. harsh chemicals), making them more suitable and efficient for industrial or home applications. Enzymes are used by the pulp and paper industry for the removal of “stickies,” the glues, adhesives, and coatings that are introduced to the pulp during the recycling of paper. Stickies are tacky, hydrophobic, pliable organic materials that not only reduce the quality of the final paper product but can clog the paper mill machinery and cost hours of downtime. Chemical methods for removal of stickies have, historically, not been 100 percent satisfactory. Stickies are held together by ester bonds, and the use of esterase enzymes in pulp has vastly improved their removal. Esterases cut the stickies into smaller, more water-soluble compounds, facilitating their removal from the pulp. Since the early half of this decade, esterases have become a common approach to stickies control. Their limitations are, being enzymes, they are typically only effective at moderate temperature and pH. Also, certain esterases might only be effective against certain types of esters, and the presence of other chemicals in the pulp can inhibit their activity. The search is on for new enzymes, and genetic modifications of existing enzymes, to broaden their effective temperature and pH ranges, and substrate capabilities. Enzymes have been used in many kinds of detergents for over 30 years since they were first introduced by Novozymes. Traditional use of enzymes in laundry detergents involved those that degrade proteins causing stains, such as those found in grass stains, red wine, and soil. Lipases are another useful class of enzymes that can be used to dissolve fat stains and clean grease traps or other fat-based cleaning applications. Currently, a popular area of research is the investigation of enzymes that can tolerate, or even have higher activities, in hot and cold temperatures. The search for thermotolerant and cryotolerant enzymes has spanned the globe. These enzymes are especially desirable for improving laundry processes in hot water cycles and/or at low temperatures for washing colors and darks. They are also useful for industrial processes where high temperatures are required, or for bioremediation under harsh conditions (e.g., in the Arctic). Recombinant enzymes (engineered proteins) are being sought using different DNA technologies such as site-directed mutagenesis and DNA shuffling. Enzymes are now widely used to prepare the fabrics that your clothing, furniture, and other household items are made of. Increasing demands to reduce pollution caused by the textile industry has fueled biotechnological advances that have replaced harsh chemicals with enzymes in nearly all textile manufacturing processes. Enzymes are used to enhance the preparation of cotton for weaving, reduce impurities, minimize “pulls” in fabric, or as pre-treatment before dying to reduce rinsing time and improve color quality. All of these steps not only make the process less toxic and eco-friendly, they reduce costs associated with the production process, and consumption of natural resources (water, electricity, fuels), while also improving the quality of the final textile product. It is the domestic application for enzyme technology that most people are already familiar with. Historically, humans have been using enzymes for centuries, in early biotechnological practices, to produce foods, without really knowing it. It was possible to make wine, beer, vinegar, and cheeses, for example, because of the enzymes in the yeasts and bacteria that were utilized. Biotechnology has made it possible to isolate and characterize the specific enzymes responsible for these processes. It has allowed the development of specialized strains for specific uses that improve the flavor and quality of each product. Enzymes can also be used to make the process cheaper and more predictable, so a quality product is ensured with every batch brewed. Other enzymes reduce the length of time required for aging, help clarify or stabilize the product or help control alcohol and sugar contents. For years, enzymes have also been used to turn starch into sugar. Corn and wheat syrups are used throughout the food industry as sweeteners. Using enzyme technology, the production of these sweeteners can be less expensive than using sugarcane sugar. Enzymes have been developed and enhanced using biotechnological methods for every step of the process of food production. In the past, the process of tanning hides into usable leather involved the use of many harmful chemicals. Enzyme technology has advanced such that some of these chemicals can be replaced and the process is actually faster and more efficient. There are enzymes that can be applied to the first steps of the process where fat and hair are removed from the hides. Enzymes are also used during cleaning, and keratin and pigment removal, and to enhance the softness of the hide. They also help stabilize the leather during the tanning process to prevent it from rotting. Plastics manufactured by traditional methods come from non-renewable hydrocarbon resources. They consist of long polymer molecules that are tightly bound to one another and cannot be broken down easily by decomposing microorganisms. Biodegradable plastics can be made using plant polymers from wheat, corn or potatoes, and consist of shorter, more easily degraded polymers. Since biodegradable plastics are more water soluble, many current products that contain them are a mixture of biodegradable and non-degradable polymers. Certain bacteria can produce granules of plastic within their cells. The genes for enzymes involved in this process have been cloned into plants which can produce the granules in their leaves. 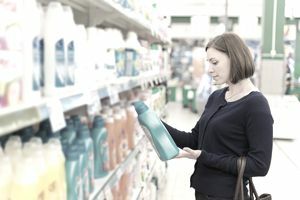 The cost of plant-based plastics limits their use, and they have not met with widespread consumer acceptance. Bioethanol is a biofuel that has already met with widespread public acceptance. You might already be using bioethanol when you add fuel to your vehicle. Bioethanol can be produced from starchy plant materials using enzymes capable of efficiently making the conversion. At present, corn is a widely used source of starch, however increasing interest in bioethanol is raising concerns as corn prices rise and corn as a food supply is being threatened. Other plants including wheat, bamboo, or other grasses are possible candidate sources of starch for bioethanol production. It is debatable whether the cost of making bioethanol is less than for the consumption of fossil fuels, in terms of greenhouse emissions. Bioethanol production (growing crops, shipping, manufacturing) still requires a large input of non-renewable resources. Technological research and manipulation of enzymes to make the process more efficient, thus requiring less plant material or consuming fewer fossil fuels, are in the works to improve this area of biotechnology.